Ah, summer. Long days (but solstice behind us, getting shorter, all downhill from here). Daylight streaming around the bedroom window shades by 5:30 AM. Heat. Exhaustion. Heat exhaustion! It's an intensely busy time of year for me. No slack: just work, eat, sleep. Thus the dearth of summer posts to This Here Blog®. Which is a shame, because there are several interesting topics I'd like to be writing about, for want of time. But I wanted to wrap a short post (famous last words!) around this photo. (Click on the image for a larger view.) 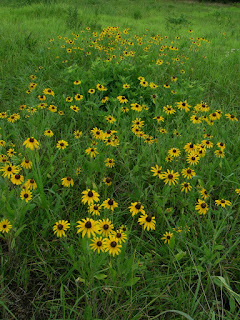 It's a pretty little spread of Blackeyed Susans from my tallgrass prairie restoration, taken a few days ago. The particular area where this photo was taken has not been under management for very long, so the overall quality of the vegetation is not high. That's the reason for so many Blackeyed Susans. I'll explain. This delightful native flower is on the "weedy" end of the spectrum by which botanists designate floristic quality, although for most purposes it would be a misunderstanding to call it a weed. Better to say it is an "early successional" plant whose ecological role is to occupy somewhat disturbed ground that doesn't contain a rich compliment of higher quality vegetation. 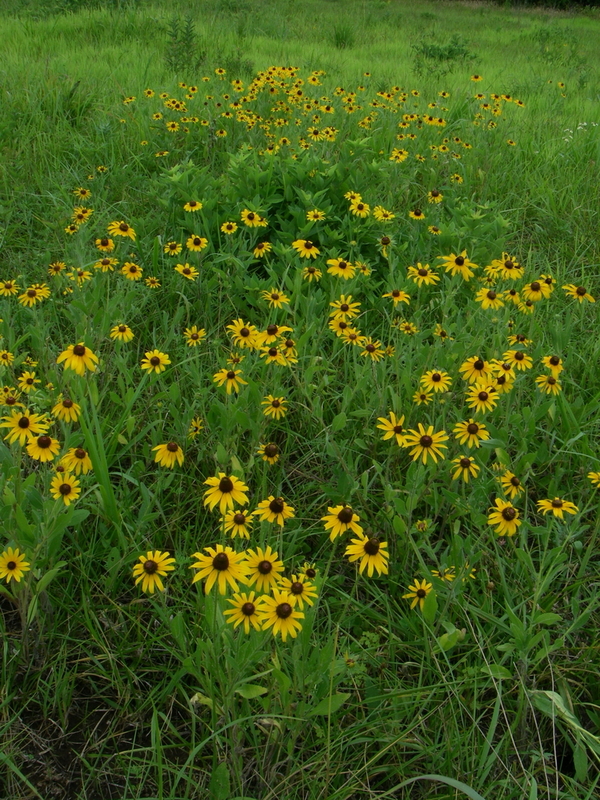 With proper management spanning years, that better vegetation will gradually appear and fill in, and Blackeyed Susan and similar plants will decline. Thankfully, Blackeyed Susans will never disappear completely. They are always present in high quality prairies, albeit in much reduced numbers compared to weedy fields, which they can fill with huge displays. Botanists assign to each species of native plant a number ranging from 0 to 10 that's called a "coefficient of conservatism" (CoC). Low numbers designate "weedy" species; high numbers designate "conservative" species. Conservative species tend to have greater fidelity to high quality natural areas, and tend to be absent from low quality or disturbed areas. Nonnative species are not assigned any CoC. Coefficients of conservatism are generally assigned at the state level, because particular species can vary in conservatism across regions. The Kansas CoC for Blackeyed Susan is mere 2, but I like it anyway. The overall quality of an area's vegetation can be gauged by computing its "floristic quality index" (FQI), which is the mean CoC for all native species present, multiplied by the square root of the number of distinct native species. A larger FQI designates higher floristic quality. As you can see, the FQI incorporates both species diversity (more is better) plus the conservatism of the species present as a measure of quality. For example, an area with 100 different species having an mean CoC of 4.5 has a FQI of 45. The FQI of a restoration site would be expected to increase over time. One reason summers are so intensely busy for me is that I'm doing battle with a number of serious weeds, some of which can constitute an existential threat to the prairie. These are weeds in the most noxious sense of the word: exotic invaders which can transform the area if they're left unchecked. I estimate that I walk 10 to 15 miles per day on my weed rounds, taking a day off only when absolutely necessary. Work days involve pulling myself out of bed at first light, working all day, getting home with just enough time to launder the day's work clothes, cook supper for the dogs, shower, get my own supper, and collapse into bed. I do manage a little correspondence, bill paying, and such before heading out for the day. There's an upside to this frenetic activity. Covering so much terrain every day allows me to constantly see what's blooming throughout the season, and to stop for the occasional photo. I also collect seeds of desirable plants as I go. And not just blooming flowers: I'm also in contact with the critters. Fawns bedded down in the grass. Momma turkeys flushed off their nests. A wondrous variety of songbirds, most of whom I don't yet know. And snakes: the ubiquitous garter snakes; huge rat snakes; occasionally bullsnakes. 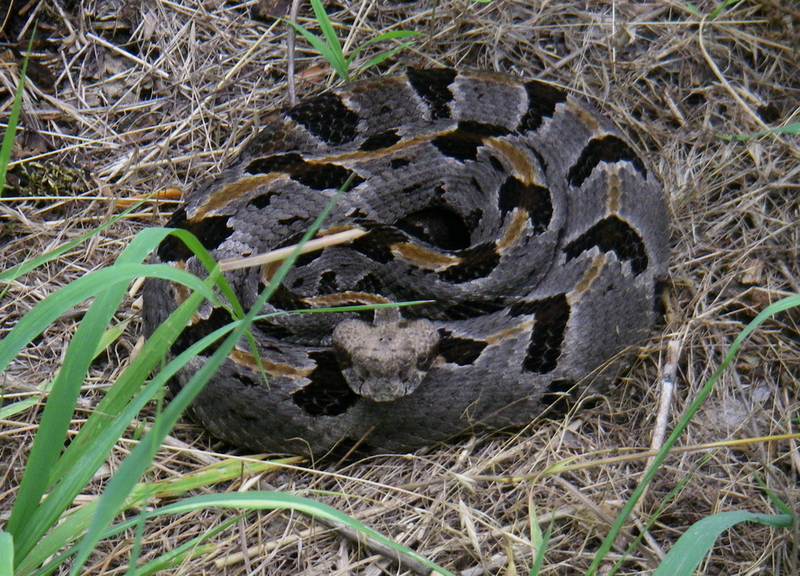 There are also the venomous varieties: rattlesnakes and copperheads. The very day I photographed the Blackeyed Susans I encountered this rattler, who lay calmly coiled as I spent a few minutes photographing him. He did not rattle, which was disconcerting. 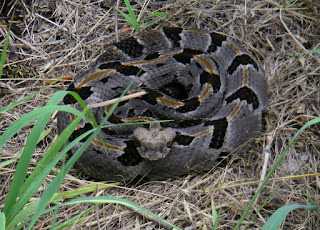 I prefer rattlesnakes to exercise their epithet's prerogative, to let me know they're present. Anyway, this one said his name is "Alfred". "But," he added, "you can call me Al. Call me Al."